Preheat oven to 325 degrees. In a small saucepan, whisk together 1 Tbsp granulated sugar and cornstarch until well blended. Stir in cold water and add raspberries. Cook over medium heat whisking frequently, until mixture reaches a boil. Allow mixture to gently boil about 5 minutes whisking constantly and reducing temperature slightly if necessary to reduce splattering, until sauce has thickened. Remove from heat and force sauce through a fine mesh strainer into a bowl to remove seeds, set aside. In a large mixing bowl, with an electric mixer, beat together cream cheese and granulated sugar until fluffy, about 1 minute. Mix in egg and egg white. Add vanilla and lemon juice. Set mixture aside. Melt white chocolate with cream in a double boiler until melted and smooth, or melt in a microwave safe bowl in the microwave on 50% power in 30 second intervals, stirring after each interval until melted and smooth. 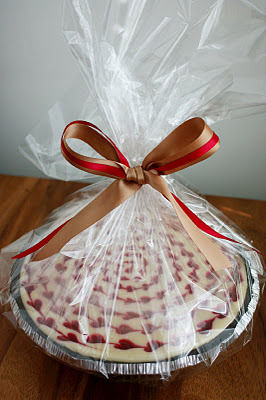 Add melted chocolate mixture to cream cheese mixture and blend until smooth. Pour 2/3 cup cheesecake mixture into the oreo crust and spread evenly over bottom. 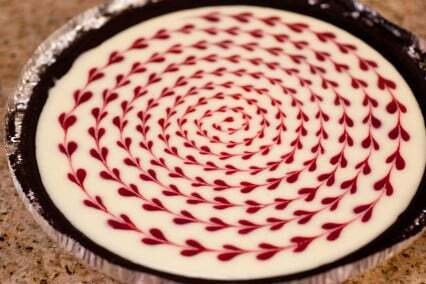 Drizzle or spoon with 2 Tbsp raspberry sauce. Slowly ladle remaining cheesecake mixture over the drizzled raspberry sauce, covering all the raspberry sauce (you just don't want it to show through). 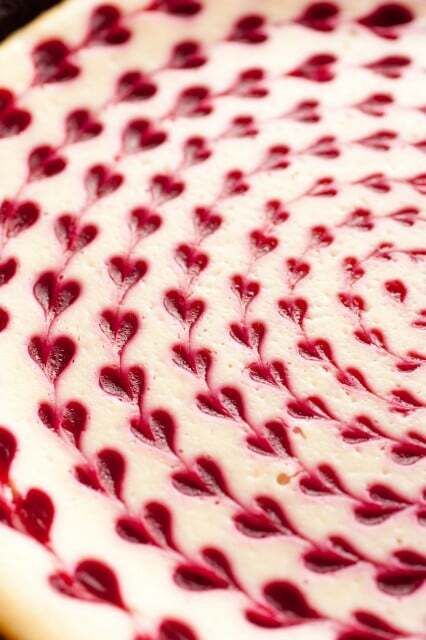 Swirl cheesecake with a toothpick or knife (your just swirling that inside layer of sauce for now, be careful not to let the sauce show through). Carefully jiggle the pan to even out the top. 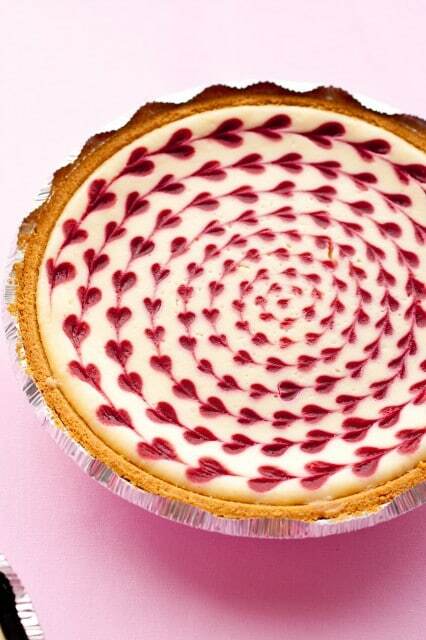 Now, fill a clean medicine syringe with raspberry sauce and begin to pipe small circles in a swirl pattern over cheesecake. Take a toothpick or sharp pointy knife and beginning with the center circle, run the toothpick through the center of each heart (don't lift the toothpick out until you finish the last circle). Bake cheesecake for 40 minutes, then turn oven off and leave cheesecake in the oven for 5 more minutes. Remove from oven and allow to cool. Cover with saved lid and refrigerate until fully set about 6 hours. Top slices with remaining raspberry sauce and optional sweetened whipped cream (for extra indulgence =).